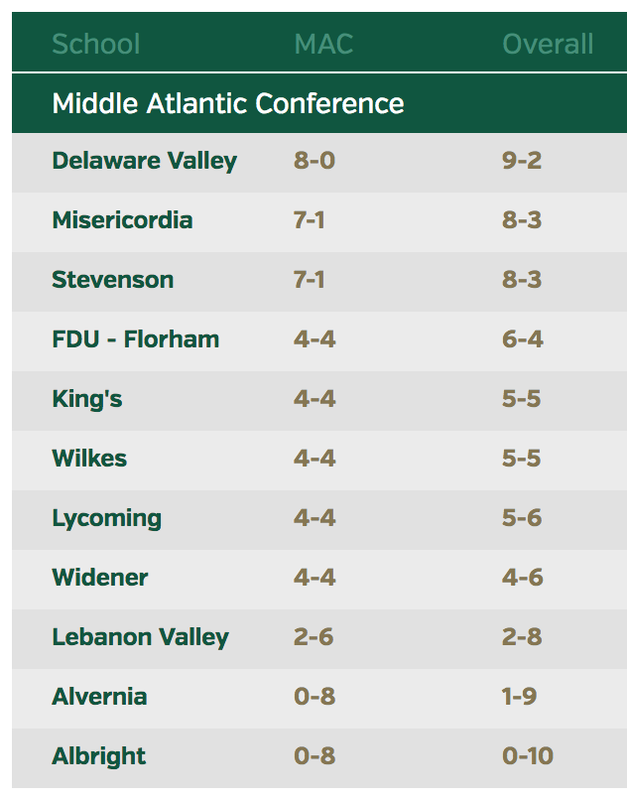 After two road games and a bye week sandwiched in-between, the Delaware Valley College football team will hit the home field for the first time in nearly a month when the Aggies host Middle Atlantic Conference (MAC) foe King’s College on Saturday, October 26. Kickoff at Robert A. Lipinski Field at James Work Memorial Stadium is scheduled for 1:00 p.m.
Delaware Valley is 5-1 overall, 4-1 and part of a four-way tie for the top spot in the conference. The Aggies are even with Lycoming College, Lebanon Valley College and defending champion Widener University in the standings and still have meetings at home with the latter two (November 2 against Lebanon Valley and November 26 against Widener). Delaware Valley is coming off a 45-30 victory at FDU-Florham on a rare, Friday night contest. The Aggies trailed 23-21 at halftime and 30-29 in the third quarter before they scored the final 16 points of the evening to put away a pesky Devils squad. Senior tailback and preseason All-American Kyle Schuberth (Darby, PA/Monsignor Bonner) led the attack against FDU-Florham and was named the MAC Offensive Player of the Week for his efforts. He carried the ball 35 times, netted 183 yards and found the end zone four times to tie a school record that had been accomplished six previous times (including Schuberth, who scored four times earlier this year against Stevenson University). In the contest, Schuberth also became just the third player in program history to surpass the 3,000-yard rushing mark in career. His 3,044 yards has him behind just Matt Cook (4,432 yards from 2007 to 2010) and Steve Cook (3,530 yards from 2002 to 2005). Despite missing the first two games of the season with an injury, Schuberth is looking to join Matt Cook as the lone Aggie rushers to record three straight, 1,000-yard seasons. He leads the conference with 616 yards and nine touchdowns on 109 carries. Schuberth’s production is a main reason why Delaware Valley is tops in the MAC in both scoring (33.2 avg) and total yardage (418.0 avg) and second in rushing (206.0 avg). The passing average of 212 yards per game ranks fifth. Two-time all-conference quarterback Aaron Wilmer (Philadelphia, PA/George Washington) did not play in the FDU-Florham game and is expected back under center this year. He has completed 82 of 140 yards for 1,072 yards and eight touchdowns. He is also a threat to run and has 168 yards and two trips to the end zone to his credit. Junior Charlie Marterella (Levittown, PA/Neshaminy) made his first collegiate start last Friday night and he was a solid 15-for-21 for 162 yard, one touchdown and no interceptions. Marterella’s scoring toss went to senior wideout Lewis Vincent (Bensalem, PA/Bensalem) and it was the 16th touchdown catch of his career, putting him in sole possession of fifth place on the school’s all-time list. This season, Vincent has hauled in 24 passes for 323 yards and three trips to the end zone. Junior wideout Rasheed Bailey (Philadelphia, PA/Roxborough) is just ahead of Vincent in the numbers as he has caught 25 passes for 513 yards (20.5 avg) and three touchdowns. He had four grabs for 83 yards last week. Defensively, the Aggies are tops in the conference in passing as they allow an average of just 182.5 yards per game in the air. They are fourth in total yardage (346.5 avg), fifth in scoring (22.2 avg) and seventh in rushing (164.0 avg). After struggling most of the night, the unit allowed no points and just 12 yards of total offense in the fourth quarter at FDU-Florham. Sophomore safety Danny Wynne (Hatfield, PA/North Penn) continues to lead Delaware Valley in tackles with 65 (38 solo). The first-year starter had a team-best 10 stops in the win over FDU-Florham. Senior John Marcelline (Bensalem, PA/Bensalem) and junior Bernard Avery (Philadelphia, PA/Roxborough) have 44 tackles apiece from their inside linebacker positions. The two combined for 11 stops last week. Sophomore linebacker Ken Kenner-English (Philadelphia, PA/Roman Catholic) had nine tackles, including two behind the line of scrimmage, at FDU-Florham. He has 35 tackles and a team-best five pass breakups on the year. Seniors Chris Vega (Mountain Top, PA/Crestwood) and Pete O’Hara (New Hope, PA/Council Rock North) lead the secondary with two interceptions apiece. Vega also has 31 tackles, three pass breakups and a fumble recovery while O’Hara has 19 stops. Junior Brandon Snyder (Shillington, PA/Governor Mifflin) had a seven-point evening at FDU-Florham (four extra-points, one field goal) and, in the process, became just third placekicker in Delaware Valley history to hit the 100-point plateau for a career. This year, he is 23-for-25 on extra-point attempts and 6-for-8 in field goal tries for 41 points. The Monarchs opened the season with three straight losses, but have won three in a row since then to get to 3-3 overall and 3-2 in the MAC. The winning streak began with a 41-40, double-overtime win at Misericordia University and continued with a 52-21 rout of FDU-Florham. Last week, they traveled to Maryland and notched a 31-24 triumph at Stevenson University. 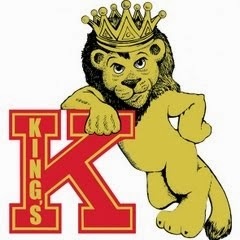 Individually, the story for King’s has been that of senior defensive end Ron Garrett as he has made national headlines by scoring touchdowns in five consecutive games. He has been featured on ESPN College GameDay and will soon be a “Faces In The Crowd” profile in Sports Illustrated. Despite being a defensive player, he is tied for 14th in the MAC in scoring and his latest end zone journey came via a fumble return against Stevenson. Garrett’s other numbers include 34 tackles, four fumble recoveries (for 185 yards and four scores), two sacks and two blocked kicks. As a unit, the King’s defense is fifth in the MAC rushing (134.3 avg) and total yardage (359.3 avg), seventh in passing (225.0 avg) and eighth in scoring (32.0 avg). Junior linebacker Nick Kaijala is tops for the Monarchs with 44 tackles while sophomore safety Anthony Martuccio is right behind with 42 stops. They had a combined 14 stops at Stevenson. On the offensive side of the ball, King’s is averaging 31.5 points (third in the MAC) and 357.8 yards (sixth) per contest. The team is third in passing (215.3 avg) and sixth in rushing (142.5 avg). Junior tailback Kyle McGrath has carried the ball 128 times for 495 yards and six touchdowns, including a 25-carry, 81-yard effort at Stevenson. He has also caught nine passes for 95 yards. Classmate Tyle Hartranft is the team’s signal-caller and he has completed 80 of 163 passes for 1,223 yards, nine touchdowns and five interceptions. He was 12-for-24 for 177 yards and one score last week. Hartranft’s favorite target has been junior Dan Kempa, who is one of the leaders in the conference with 34 receptions for 659 yards and six touchdowns. He had five grabs for 67 yards and found paydirt once in the win over Stevenson. That touchdown catch came early in the fourth quarter and it put his team ahead to stay.